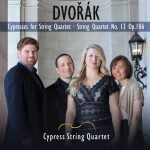 The Cypress String Quartet debuted on AVIE with a recording of their namesake work, Dvořák’s “Cypresses” coupled with the composer’s expansive G major Quartet, No. 13 (AV 2275), “a lovely performance,” according to International Record Review. 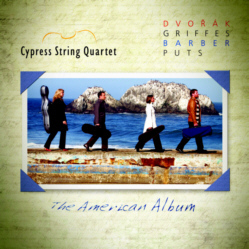 The Czech composer features again in the ensemble’s American Album with his beloved “American” Quartet, which shares the program with Barber’s String Quartet, featuring the famous Adagio central movement,”Two Sketches Based on Indian Themes” by Charles Griffes, and the single-movement Lento assai by Pulitzer-prize winning composer Kevin Puts. This recording is a stunning appreciation of the American spirit from 1893 to the present.